The Secrete Life of Machines is an entire series where they explore most of machines found in a modern household. Interestingly the series is old enough where they call computers word processors... Remember those? The very expensive bridge gadget that filled the gap between the typewriter and the computer for a few years. Speaking of typewriters..... I'm seeing these all the time at thrift shops now, who's buying these and what are they doing with them? Maybe I'll pick one up... never mind, I just remembered the ink ribbons and correction fluid. I did actually learn to type on a typewriter "way" back in 1990. I remember I liked the one with the ball that had the letters around the outside. It pounded those letters onto the paper in a very satisfying way. 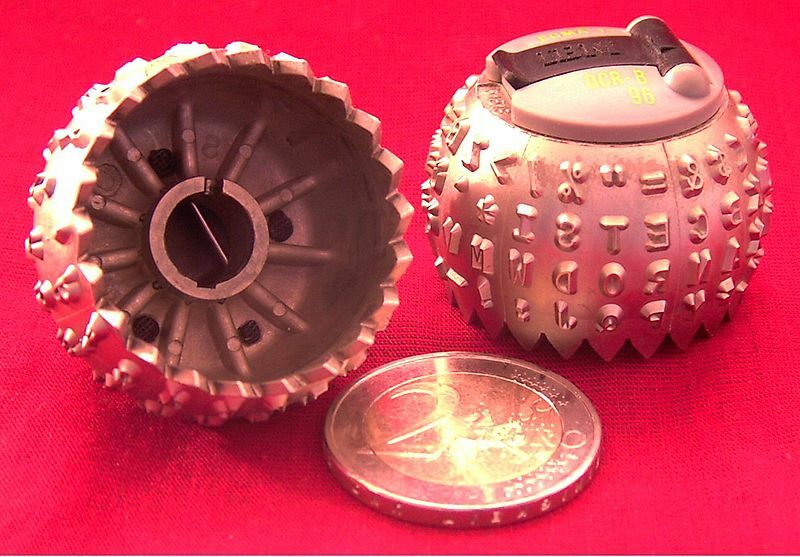 The IBM Selectric. Anyway, here's the video. It's 25 minutes which means three youtube clips, I uploaded it without compression so you should be able to watch it full screen. I was very intrigued when it got to the history of Singer, quite an interesting fellow, but maybe not how you'd expect..... Enjoy! Such endearing videos, loved the 'sewing song'. What's the title, who sang it? Must have taken you quite awhile to find the unusual videos. Are there more of these on youtube? Oh, I have an old mechanical olliveti typewriter, still working wonderfully with that typical 'ting' sound on return. Got it for $3 (:LOL)...most have been scrapped. Thank you very much for posting the charming video. To me, the mechanical satisfaction of a sewing machine is rivaled only by the bicycle. I still have an IBM Selectric at work (in a library--where we have all sorts of odd-sized bits of paper and labels that computers can't print on). We stopped using it a few years ago. (Now we just hand-write what the computer can't print.) But we couldn't bear to give it up, so it sits in a corner. The little balls are called elements. It just occurred to me that they are a lot like sewing machine cams--you can change them out for different fonts or characters. Dude, have you seen this blog! Thank you! I really enjoyed the videos! Going to keep up with your blog. Very interesting!